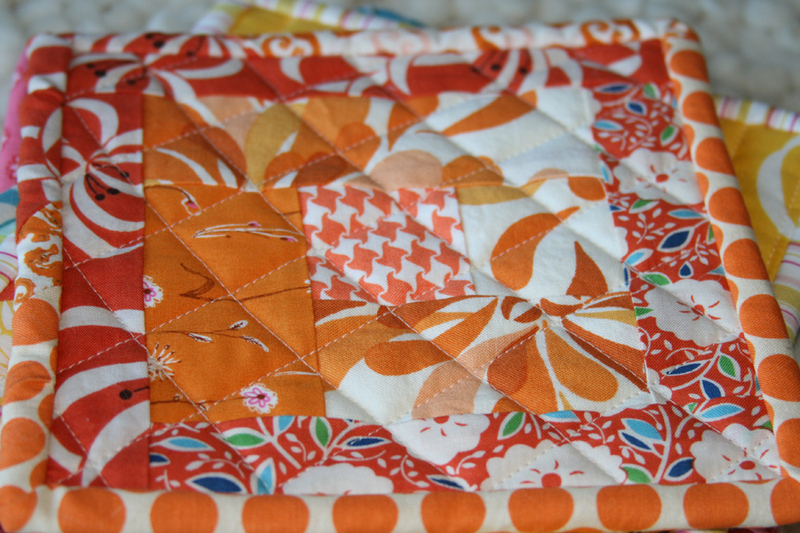 Not a quilt this time, but quilty nonetheless! We’ve been using some very old potholders for a long time now. In reality, they were never meant to be potholders. 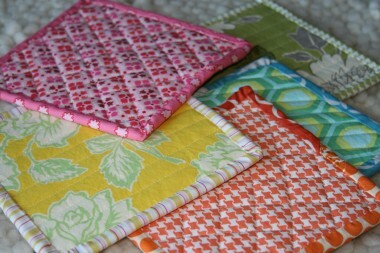 They were actually used as examples of quilts you could order from a local store. While they did have batting between two pieces of fabric, they really weren’t very useful as potholders – thin batting led to hot hands when pulling something out of the oven! In any case, I’m not sure why it took me so long to make new ones. For these I continued with the rainbow hues and pulled several fabrics of one color for each potholder. I made quick log cabin blocks for each front, a piece of corresponding fabric for the backing and whatever leftover fabric for binding. 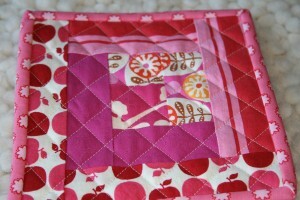 This was a good project for using up fabric scraps, and also a great way to use up my leftover batting. 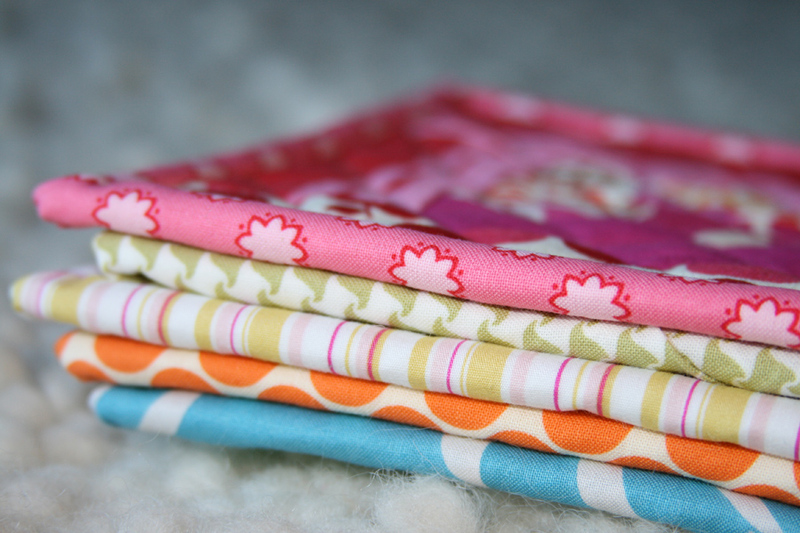 Each time I make a quilt I’m left with strips of batting – not large enough for another quilt, but large enough that I don’t feel I can throw it away. 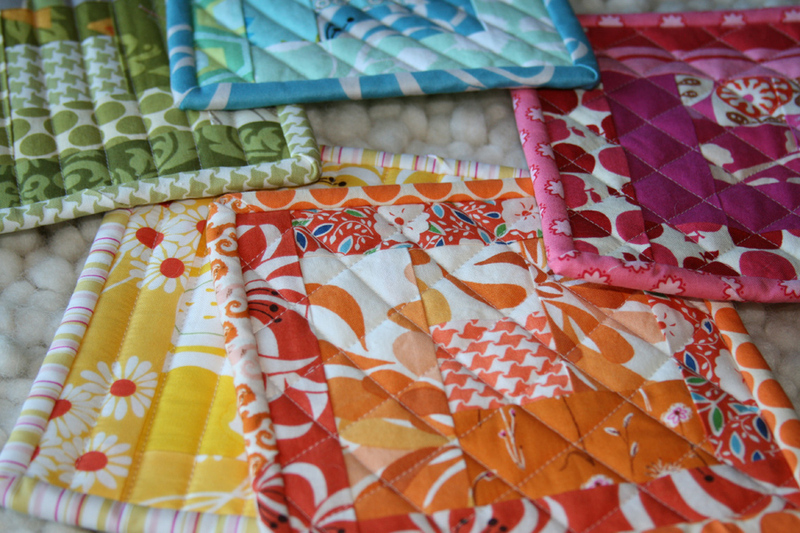 I used two layers of batting for each potholder and did some simple straight quilting on each. And I’m pleased to report… no burnt hands! 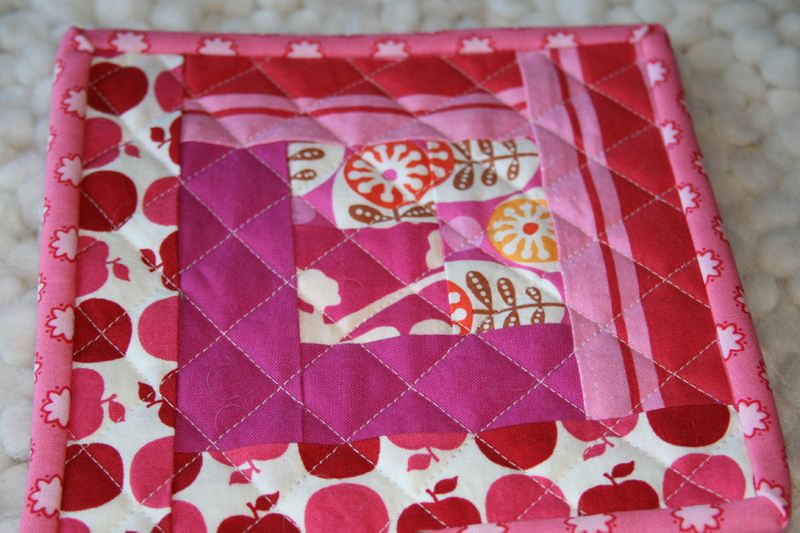 This entry was posted in Household Goods and tagged Fabric, handmade, log cabin block, potholders, quilt block, quilting, scraps. Bookmark the permalink. They look great! I’m thinking of making pot holders for my sister’s in law for Christmas! I hope mine turn out as great as yours! What beautiful results! 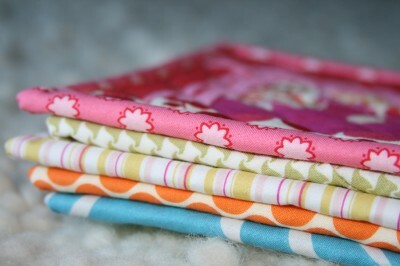 I have tons of scraps and fabrics, and these seem like a great holiday present. I have a question, what type of batting did you use? These are the most beautiful potholders I have EVER seen! Love them! The orange one is my favorite! Nice work! These are so pretty! I love all the colors. I LOVE these! Your creativity never ceases to amaze me. I can’t decide which I like best — orange? green? blue? How ever do you decide which to use? Cute idea! I compulsively save those batting scraps, too, and this is a great use for them. How big are they? 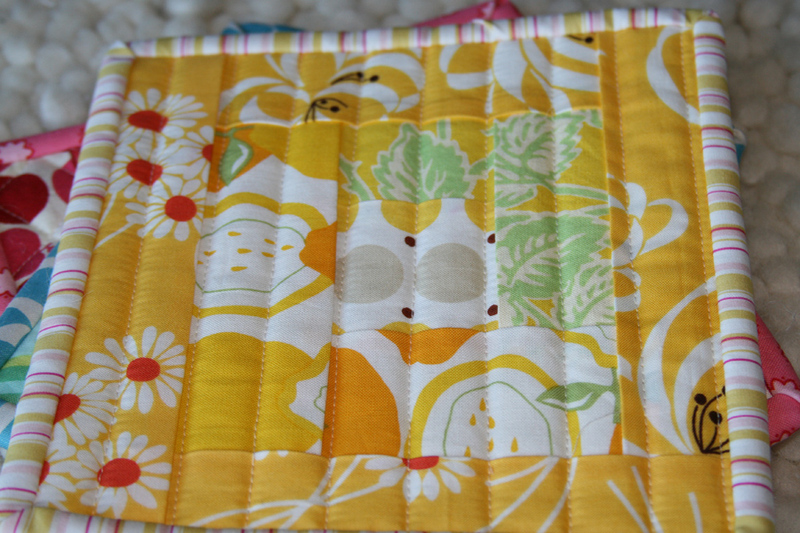 I love the monochromatic pot holders. They look great. Lovely rainbow. As for the “hot hands”- I’ve read that you can also put pieces of an ironing-board cover inside them, to make them more heat resistant. I’ve never tried it, though. I love these. they would make great gifts this christmas! i’m making potholders for my mom at this very moment. i’m so glad you said something about 2 layers of batting. i was just about to quilt them with one. thanks for the save! Oh these are great! And what good quick Christmas gift they could be! Hmm…. 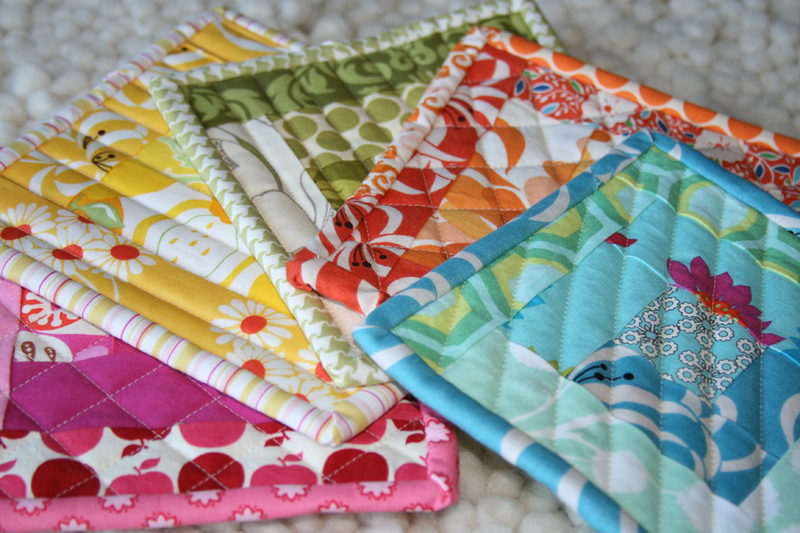 oh how I love these potholders! I have that on my list to make for gifts this season. 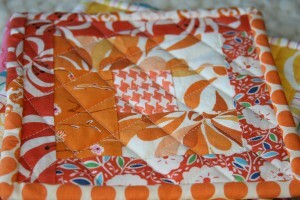 I love the way you did the quilting, and the color combinations too. Wow! Stunning! 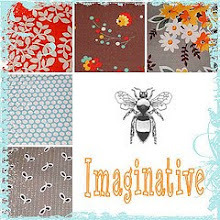 Do happen to know what the orange herringbone fabric is? Thanks! 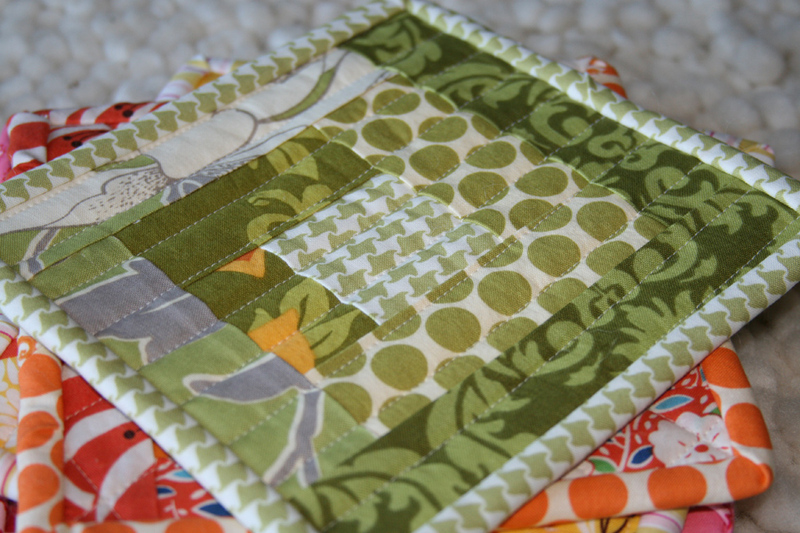 I just love the potholders! Can you tell me what sizes you made the strips? I have not done this pattern before and would love to do some of these for gifts. very beautiful ! full of colors ! I just LOVE these! I am making some right now, using some felted sweaters-that-never-materialized-into-anything for the insides. Wool doesn’t transfer heat very well, and isn’t very flammable and these I felted for too long so they are pretty thick. Mine are turning out cute, thanks to your inspiration! These are SO PRETTY! I love ’em. 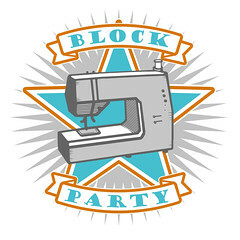 Linking to this post in my second “Walk around Blog Land” today. 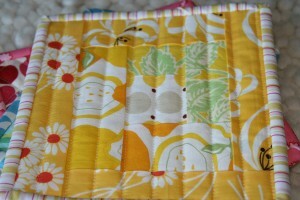 Is there a tutorial for making these potholders? I love these! I would love to meke some. Please let me know where I can get the instructions from. Thanks! You can use a layer of Insulbrite between the layers of batting. That will make sure you don’t get “hot hands” when using them. Cute tutorial. Gave me some ideas about what to do with small pieces of fabric and batting.